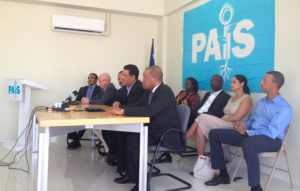 WILLEMSTAD - If it’s up to the coalition partner PAIS, the current coalition will finish their term. “Let's keep the continuity and finish the work that was put into motion. You do not want to interrupt this work by small issues happening at the political level,” says Deputy Prime Minister and Minister of Administration, Planning and Government Services, Etienne van der Horst. The Ministers representing the political party PAIS indicated during a media program that the coalition must not give way to conflicts that are going on. “It is so important for the country that we continue. It is more important than Marvelyne Wiels staying as Minister Plenipotentiary or not,” said Van der Horst referring to the recent developments in parliament where the MPs debate on the report of the Ombudsman of Curaçao on Wiels.